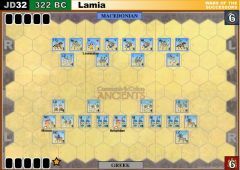 By 318 BC the Successors had formed two competing alliances: the ‘Royalists’ who claimed to fight to maintain the empire for Alexander’s infant sons, and a rival coalition that sought to claim their own independent kingdoms. 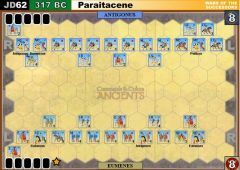 The opposing Successor Armies in Asia—one commanded by Antigonus, the other by Eumenes—met in battle at Paraitacene in 317 BC. Antigonus was by now the most powerful of the Diadochi, controlling most of Anatolia and the eastern satrapies. 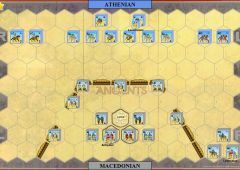 Eumenes had the backing of Alexander’s heirs and a large war chest, though the fact that he was a Greek and not a Macedonian was a major handicap. 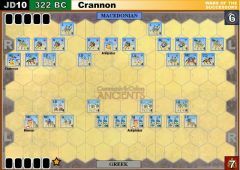 Antigonus fielded 28,000 infantry and 11,000 horse. Eumenes’ force of 35,000 foot and 6,000 horse included the veteran Silver Shields who had fought with distinction in all of Alexander's campaigns. 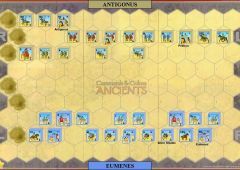 The battle opened with Antigonus’ light horse attacking Eumenes right. 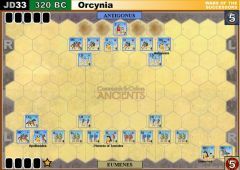 This attack was wrecked by Eumenes’ heavy cavalry. 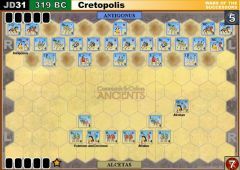 Meanwhile in the center, the Silver Shields drove back Antigonus' phalanx. 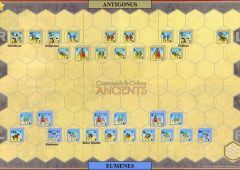 Antigonus’ army was on the ropes when he pulled off a stroke that evened the score. 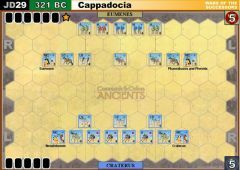 He charged through a gap and was successful in routing Eumenes' left flank. Both sides at this point were exhausted and returned to their camps. 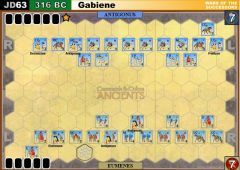 Antigonus claimed victory but realistically the battle was a draw and a final resolution would be at Gabiene, a year later. 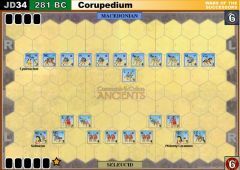 Winning side must have a margin of at least 2 Victory Banners to achieve a decisive victory otherwise the battle is declared a draw. • The hill hexes are impassable. • Use the Medium Hoplite rules. • The Silver Shields is a special unit. Place a special unit block in the same hex as the Silver Shields unit to distinguish it from the other units. The Silver Shields will score a hit for each leader symbol rolled in close combat and may ignore 1 flag. 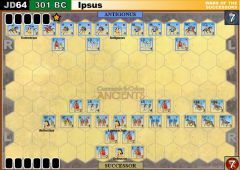 The large left-wing of light cavalry of Antigonus is a real weakness. 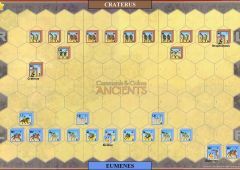 Eumenes concentrated his attacks here in both games and totally destroyed it easily, with most fleeing off table. 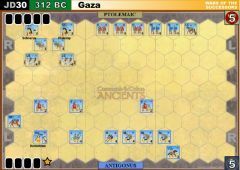 In the first game Antigonus' phalanx collapsed to complete the rout with some utterly appalling combat dice. 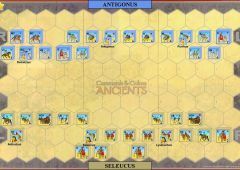 In the second game both flanks collapsed for Antigonus. 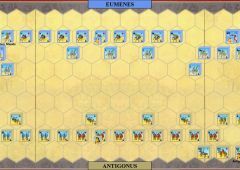 In both games, the Antigonus players found that they were unable to protect his weak left flank.